After buying that lovely Loomtogs set of separates, I decided to look for some vintage ads to give a better idea of the types of things the company made. 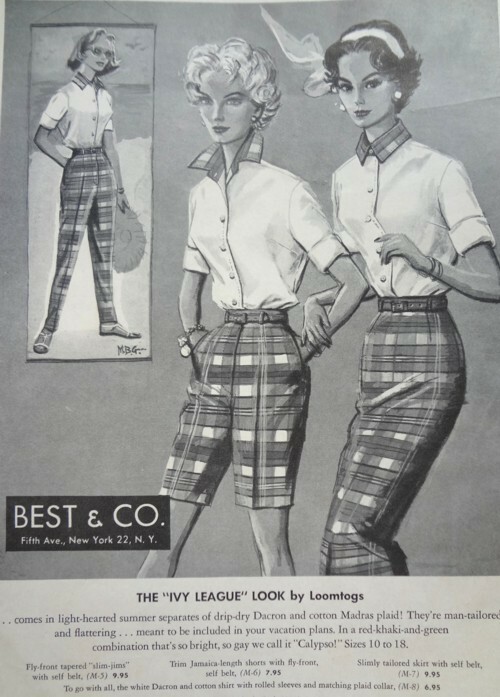 The ad above is from 1957, and shows pants, shorts and slacks in madras plaid. Note that the blouses have matching madras collars. 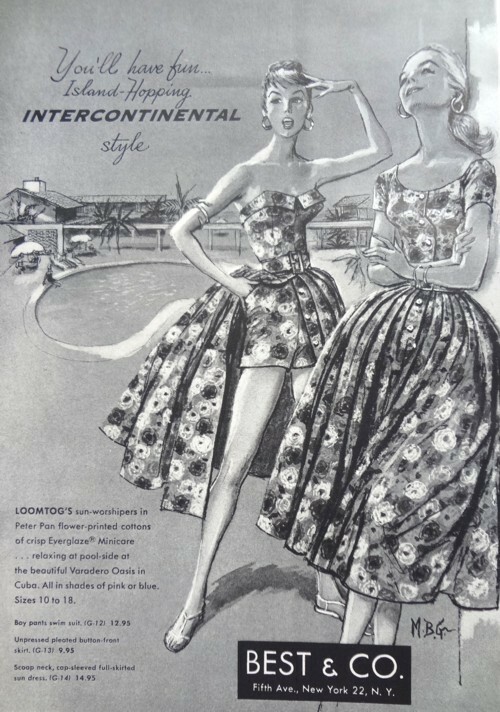 This ad is from 1958 and the clothing featured is made from Everglaze Minicare. I’ve had Everglaze fabrics, and they have a shiny coating, like chintz. And regardless of the name, I’ve found that the glaze often washes off. And finally, this ad is from 1960. Note that the jacket is lined with the same red and white gingham that was used for the blouse. My guess is that there were also shorts and slacks to match. The mix and match separates which illustrate this post date to about 1960. 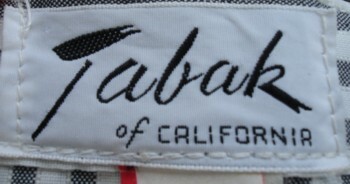 The designer was Irene Saltern, who designed for Tabak, one of the large California sportswear companies. 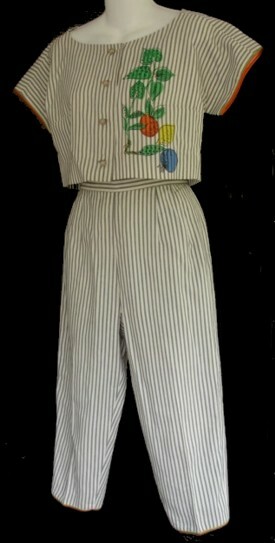 In 1950 Saltern designed one of the first mix and match lines of separates for a major California manufacturing company. 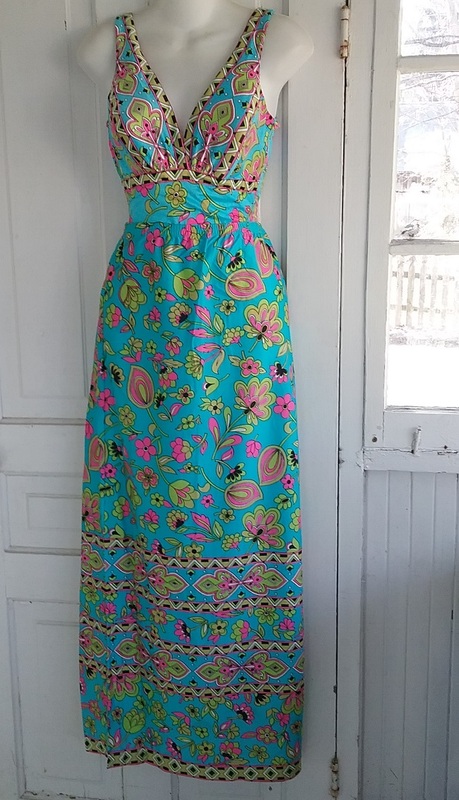 By the time she designed these in 1960, separates were pretty much the industry standard. These separates actually came from Ms. Saltern’s estate. Separates are clothing pieces that one can mix and match in order to make a wide assortment of ensembles. Today we take separate dressing for granted, as it is the method by which most of us get dressed every day. We take a blouse, pair it with pants or a skirt, and top it with a sweater or jacket. Chances are, none of these pieces were bought together, but through the use of color and style, an ensemble is born. One hundred years ago, this was a new idea. Women had been dressing in matching suits and in dresses for many years. In the last years of the 19th century the spread of ready-to-wear manufactured clothing gave rise to a new way of dressing. Factories began making only one type of garment, such as shirtwaists or skirts, making these items readily available. 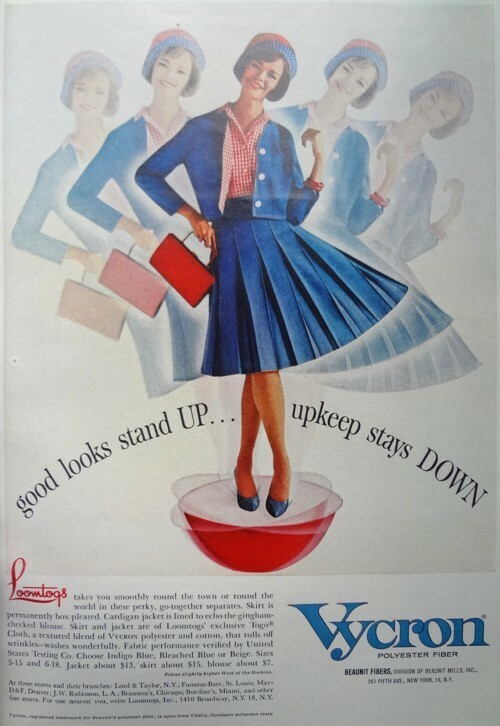 Working women wore the skirt and waist combination, as did middle and upper class women for casual occasions. 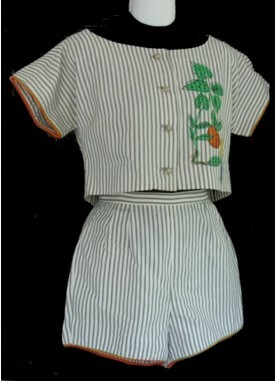 By 1920, separates dressing was well established. World War I had put many more women into the workplace, many of whom wore the waist and skirt combination. The addition of a jacket or a sweater turned the outfit into a kind of informal suit. Women were now faced with many choices, and the term “separate” crept into the fashion vocabulary. The earliest reference I’ve found is in the spring 1919 New Idea Quarterly, which was a sewing pattern catalogue. 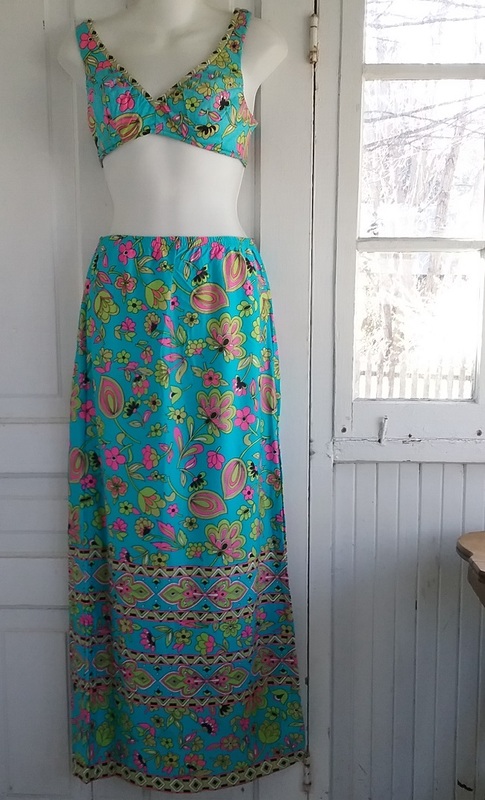 The Separate Blouse and Skirt was the caption of one page of such choices. 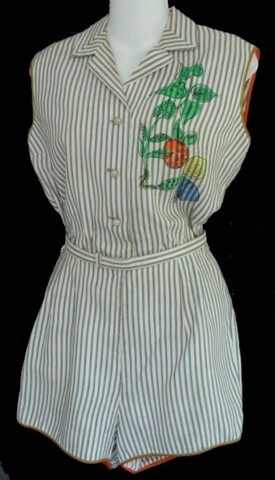 In the 1920s women increasingly turned to sportswear, and as a result, separates became even more popular. Some stores opened sportswear departments in which women could shop for skirts and overblouses, jackets, sweaters, and near the end of the decade, beach pyjamas and eventually, slacks and shorts. American women found that separates dressing fit a lifestyle that was increasingly mobile. 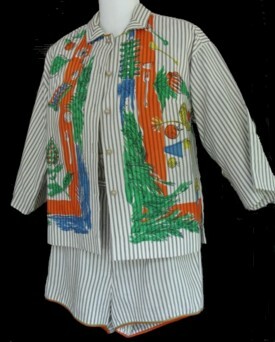 A wardrobe of mix and match clothing worked well for vacations, which were becoming commonplace. Women found that with separates they could have more “looks” with less clothing. In the 1930s some designers began producing co-ordinating wardrobe pieces, all of which were designed to match, but which were sold separately. By the late 1940s, this was a common way to shop, and stores and mail order catalogues might have had entire departments of mix and match separates. A playsuit became a dress with the addition of a matching skirt. 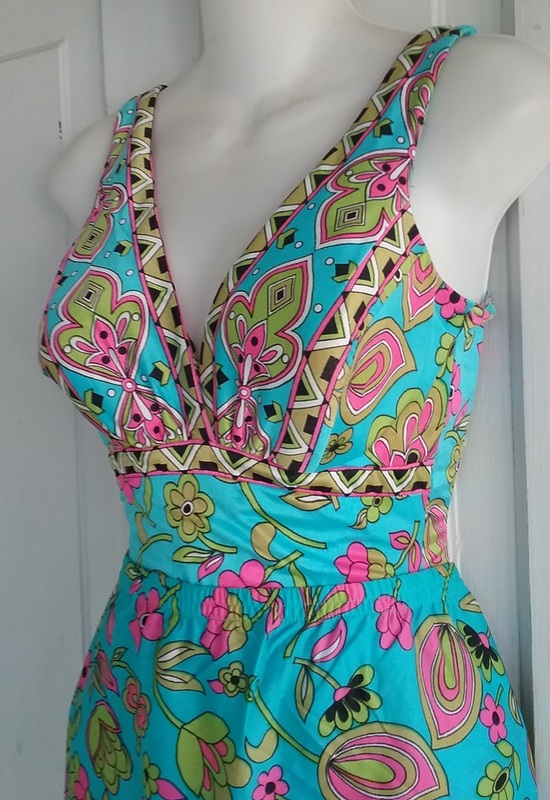 A bathing suit became a sundress in a similar manner. A blouse and skirt became a suit when a matching jacket was added. Many designers became known for their separates collections: Tina Leser, Claire McCardell, Bonnie Cashin, Greta Plattry and BH Wragge come to mind. It’s no coincidence that these were sportswear designers. The idea of sportswear and separates went hand in hand, as Western life continued to become more casual. Perhaps just as important were the hundreds of mid-priced ready-to-wear companies who made separates. Some, like Villager and Ellen Tracy, started out as blouse makers. Others, like Bobbie Brooks and Koret of California, produced large wardrobes of mix and match separates.